Discussion in 'Cooking & Water Purification' started by NevadaBlue, Nov 8, 2018. Let’s do this for alcohol stoves, like the Esbit stove thread. More fun. Besides, I need some help. I had made a penny stove but never fired it. I decided to fill it with insulation packing as a spill proof measure. It was almost impossible to get lit. I finally just wasted a bunch of alcohol and filled it to overflowing and lit the whole mess. It worked well after it started generating. I think that a packed stove has to have a large opening at the top. Seems it couldn’t get going without more air. I plan to cut out the top of the stove and put screen in to hold the packing and see if that works. DirtmanDave, Yankee Cymro, DavidJAFO and 23 others like this. Good idea for a thread brother. I've never used an alcohol stove. Is the insulation just regular house insulation ? I've been looking at the trangia burners online, but a penny stove looks like a easy build. On a penny stove how far apart is the spacing of the holes ? Then it's just packed with insulation ? Sosteve, bacpacjac, MrFixIt and 7 others like this. Once lit do you cover the fill hole with a penny ? DirtmanDave, Sosteve, bacpacjac and 7 others like this. It can be ordinary fiberglass insulation from what I see on youtube. This is stuff I salvaged out of our dead kitchen stove. It could be fiberglass or ceramic, not sure. Yes, once lit, the penny goes over the hole to create a bit of pressure as the alcohol evaporates. This is my first stove like this. Not like the Trangia at all. I went back and watched a bunch of videos and apparently getting them started is just the way it is... difficult. Splash alcohol on the outside and light. I don’t like that. Not sure what I will do next. I want to build a ‘Trangia like’ stove next. Pop cans with an inner wall and no packing. This video shows something like a Trangia. I think his jet holes are too large though. Hole spacing... I think my stove has 8 holes, but it is a hybrid thing. There are ‘jets’ around the outside shell too. Next one will be a pure simple penny stove. Winterhorse, DavidJAFO, Sosteve and 12 others like this. Thanks brother that looks easy enuf. Sosteve, bacpacjac, MrFixIt and 4 others like this. Lit up here in the foreground are the minibulldesigns choke hazard and the very small bongo stove. These are two of the smallest stoves tinny ever sold. The choke hazard hot enough to boil a couple cups of water, maybe as many as 3 cups. But the bongo is only hot enough for a cup-cup and a half boil. Photobombing in the background is the MSR I was able to buy from @AngryDaddyBird this summer. Winterhorse, Sosteve, Lichen and 10 others like this. Edit: I tried adhesive once; didn't much care for it. These two I just stapled the inner wall together and it fit snugly enough. Winterhorse, Sosteve, Bobsdock and 8 others like this. @zelph , come over and play! Winterhorse, Sosteve, Bobsdock and 6 others like this. Funnily enough, Jurey's penny stove is what got me more onto this site (eventually) from being a general camper/outdoors guy. Had kids and didn't have as much extra money for "gear" anymore, so I looked into DIY gear; started with pop can stoves and eventually tapped into the Self-made gear forum here. Like many enthusiasts, I've built many different pop can alcohol stoves, some I've liked and some less. Some I've built just for fun, to see if they'd work (who here doesn't like playing with fire? ), knowing they'd not be practical for everyday use. I've got quite a few working can stoves kicking around now, but more and more I end up using a commercially made burner like a Trangia or a Toaks Siphon. IMO, some of the best things about pop can stoves is how cheap and easy they are to make on the fly, but they will always be more fragile than I like, so I have trended away from the more complicated designs other than for the fun of building them. Can stoves excel at boiling water, but aren't always great for other cooking, as they often can only be on full steam or off, and often require a pot stand to work best, which is a whole other ball of wax. All that said, one of my favourite can stove designs is this one, made with a small can (Red Bull or V8) and only a few (6-8) jet pleats. Quick, easy, forgiving, can be made with just a pocket knife. As these stoves rely on thermal feedback to bloom, my go-to that have in most of my DIY brew kits is the Fancy Feast stove, as it's a stove/pot stand combo, can be made cheap with household items (carbon felt is nice to have though), is somewhat resistant to the breeze, and can be used effectively in colder weather. Ironically, for the purposes of this pic, the penny/jetted stoves were super hard to light and get to bloom. Yankee Cymro, DavidJAFO, central joe and 13 others like this. The Penny stove isn't the easiest burner to build or dial in, that's for sure. In my experience, fiberglass isn't necessary for the running of a penny stove, and I never had spill issues. Like Trangias, these little DIY burners need the heat feedback from the flame to boil the alcohol fuel to generate the fumes to power the jets. That's why you need to prime it (read as: flood it) to get it to start blooming. When you put it in a little boxed-in stand like that the thermal feedback is likely too much (too hot) and it overboils the fuel and you get a runaway burner. 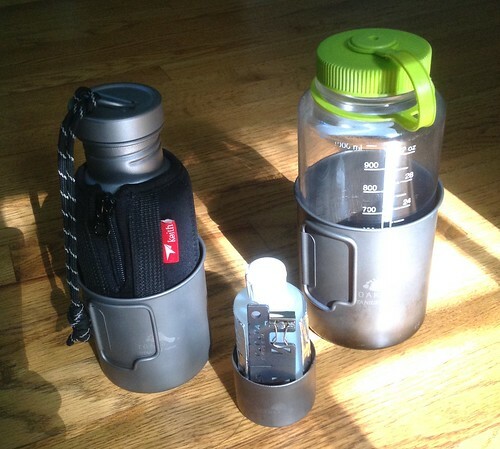 It's hard for a pot of water to capture all that heat effectively and you waste a lot of BTUs. If I may suggest, try building a Fancy Feast or a "#2 Tom's" stove for a kit. Since they both integrate a burner and a pot stand, really all you need is a windscreen (and I think you've got a corrugator IIRC) and maybe a piece of foil as a reflector for the bottom. central joe, Sosteve, Bobsdock and 9 others like this. I agree with @Big ian . I've read where you can even have your windscreen too close to an alcohol stove. They can get too hot and need air around them. But I figured priming was a normal part of these small liquid burners. Even Svea 123's need primed to get going more quickly. I've never made one. I've wanted to, but there are so many things I don't understand about how they work. And I've seen too many pics and vids of alcohol burners that did not work properly. Insulation, no insulation; open top, closed top; need a pot stand, can set the pot right on the stove... Maybe this thread will clear some of that up. I recently saw one where you could set the pot right on the stove and man, that thing had a nice bloom. It looked like a pot on a gas stove burner. LarryB, central joe, Sosteve and 8 others like this. I have found an essential accessory for alcohol stoves is a silicon pot holder (or piece of) to use as a base. Trying to get a bloom sitting on cold ground can be hard. Exactly, you need to practice before hitting the woods. For example, some stoves get too hot in my caldera cone. central joe, Sosteve, Bobsdock and 5 others like this. I use an alky stove just about 5 days a week to boil water for my oatmeal breakfast at work. I have 4 different ones. A Triangia (thanks @Skruffy ! ), a @zelph StarLyte Companion, A homemade one from @icemancometh and 1 that I made (it doesn't work well). central joe, Sosteve, Bobsdock and 7 others like this. I have 2 stoves the @snwmpr made for me awhile back . One is a basic catfood can with holes punched in it. The other is like a trangia made from a soda can . That one is my favorite . Ive burned fuel tabs on the underside too . Love the trangia. Even though its heavy for what it is I dont really need much else. Ill update with pics later . It was made from a small aerosol spray can; the stove itself is 1 3/4" dia. X 1" tall. The small size and heavy-gauge aluminum make it a lot more dent-resistant than a pop-can version. No pot stand is needed with this style of stove, the pot sits right on top. The wind screen is just folded aluminum foil; the fuel bottle is a recycled "5-hour energy" container. For those (like myself ) who are too cheap to buy tiny modelmaker's drill bits for drilling the jet holes, I found that they could be punched instead, using a thumbtack or similar. DavidJAFO, central joe, Sosteve and 8 others like this. Also: I experimented with packing/wicking, using fiberglass insulation...a packed stove will burn for slightly longer than an un-packed one, but will also take a bit longer to get going. I found it not worth the effort, personally. central joe, Sosteve, Bobsdock and 6 others like this. Sitting on cold ground can be hard on you bum too. I also carry a pad for that. Love alky stoves - lightweight/compact/multi-tasking... they are a staple EDC for me. FUEL: Consider using 190 grain alcohol (eg, Everclear) for fuel - a bit more expensive (with booze tax) but it's the best liquid multi-tool. Dilute 1:1.5 with water for Vodka; dilute 2:1 with water for hand santizer, bandanna wet wipes, eyeglass cleaner; use to clean/sterilize your pot/cut/utensils after meals; pine pitch/glue remover; spot remover; wound prep; least noxious fumes in an enclosed space (eg tent); if it leaks in your bag it'll clean as opposed to contaminate. SIMMER: Try varying the height of your pot relative to the stove to reduce output or simmer. With a separate pot stand, you can use a flat rock to raise the stove height. With certain stoves, I notice that the smaller the stove-to-pot gap, the more it starves the air flow to the alcohol reducing the stove's output.... pretty works much like the simmer ring on a Trangia. ALCOHOL CANDLE: Use your stove (or any receptacle) to make an alcohol candle for a Palmer Survival Furnace - just need a wick and piece of tin foil or tin can lid. 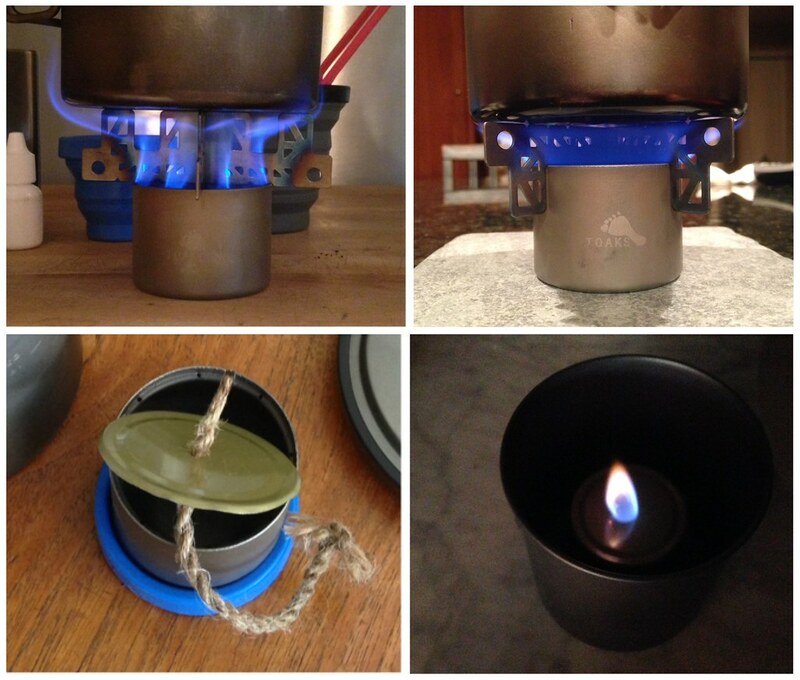 Place the 'candle' in your pot/cup to reduce flame risk from the sides. Put a couple ounces of water in the bottom of the pot to reduce the spill risk (if it tips over, the water will dilute the alcohol below its flashpoint). Candle burns ~5mins per ml. COLD/SNOW: I use few wood sticks as a platform in the snow - it insulates the cold and prevents the stove from melting down into the snow. Alcohol has a relatively high flashpoint so cold fuel can be tough to initially start - I usually tip my stove at an angle so the alcohol is right up to the edge/lip, then heating the stove edge/lip with a lighter for ~2 secs is enough to get it vaporize and light....once lit, my capillary hoop stove full blooms in 5 seconds. Another cold start method is to throw a pinch of cotton the size of a down feather (micro wick) in the alcohol and hit it with a ferro spark. LarryB, KittySlayer, central joe and 15 others like this. I recommend Mr Yuck stickers on non-standard fuel bottles. Poison control usually will send thm free. central joe, Sosteve, Vilke and 7 others like this. Well, truth be told I'm going to EDC the 190 grain either way... just figured for the extra 1.5oz and virtually nil incremental space, I might as well include the stove too . central joe, Sosteve, Vilke and 6 others like this. I just write on them with sharpie .But I forgot about the Mr Yuck stickers . Thats a great idea! central joe, Sosteve, Vilke and 5 others like this. I made a pad for my stove with 2 layers of corrugated cardboard wrapped in duct tape. Nests in the cup under the stove . As far as fuel Im fond of buying yellow heat . I keep sealed bottles in the car and bring a small bottle on trips . central joe, Sosteve, bacpacjac and 5 others like this. Yankee Cymro, DavidJAFO, central joe and 8 others like this. The silent comments are really true. May have to add a fancy feest to my collection. central joe, Sosteve, bacpacjac and 3 others like this. Yankee Cymro, central joe, Sosteve and 3 others like this. I know what you mean I'm in my 70s and it doesn't take much background noise for me to miss most of a conversation. I have a couple Svea 123s and those things are like a jet engine. A while back me and two of my brothers and my youngest brother's best friend were sitting around a fire. Me and one brother on one side were drinking Decaf coffee, brother on the other side and his buddy were drinking 64 calorie beer. Brother's friends starts talking about his prostate problems. My brother turns to me and says, "WTF happened to us?!" It just happens one day you're a wild and crazy kid and the next thing you know you wake up an eccentric old man. LarryB, central joe, Sosteve and 6 others like this. Made a fancee feest stove today. Works well. central joe, Sosteve, OrienM and 6 others like this. The Fancee Feest can burn kerosene and isopropyl cleanly if the pot support is about 3/8" high. Good stove to have in a bug out bag. central joe, Sosteve, MrFixIt and 4 others like this. Time to go to plan "B" Do the Trangia type stove. central joe, Sosteve, MrFixIt and 3 others like this. Somebody probably already asked this but did you prime the stove first to vaporize the fuel? central joe, bacpacjac, Sosteve and 3 others like this. Some stoves need more priming than others. Penny stoves prime from lighting a little fuel in the top crater. Some pressurized side burner stoves utilize a primer pan or a wick soaked in fuel to prime. I use a small pie plate from Walmart's 50 cent pies or aluminum foil underneath the stove because heat rises. Just put a few drops in the primer pan and light it. Once it warms up the vapors will come out of the jets and light when they hit the flame. No priming until I just poured alcohol all over the place in desperation. Then it went. But, thanks for the info about the ‘fancee feest’ type stove. I built my version just now. All steel because that is what I had. PERFECT stove. Instant ignition. I used fiberglass cloth because I had that too. Also, in the bottom, just for fun, I fitted one of those screen type sink drain strainers to hold the fiberglass cloth ends down. I did wrap the cloth around the inner can and up inside some. I put 2 ounces of alcohol in, just because of the disaster yesterday. Next test will be a timing with only 1 ounce of fuel. It is about 42 degrees F, slight breeze, no wind screen. Lit the stove, put the cup of water on (I do need to measure what this cup holds) and almost instantly there were little bubbles in the water. Steel cup. Did use the lid except when taking pics or checking for boil. 7 minutes, full rolling boil. As an experiment, I used the can seen above as a snuffer. Worked great. LarryB, central joe, bacpacjac and 10 others like this. Where do the flames come out? I can't see any. Is the cup sitting right on top of it? Does the inner can just wedge in and stay put? central joe, bacpacjac, MrFixIt and 2 others like this. The stove is made of two layers. An outer can and an inner, bottomless one. A layer of wicking (carbon felt or fiberglass, something that won’t burn) goes between the layers and holds it all together. Pot sits on top. One little vent hole to keep from pressurizing the stove, just below the rim of the inner can. That is all there is to it. Brilliant. The flame is on the outside of the inner can at the top of the wick. You can’t see it because of the sun. That is one of the dangers of alcohol stoves... invisible flame. The pot closes off the top of the stove and that inner can is the pot stand. Seriously brilliant design. I will have more. I do want to make (well finish) the Trangia type stove though. LarryB, central joe, bacpacjac and 4 others like this. So there's one solid ring of flame instead of the individual jet flames from drilled holes. What are the pluses and minuses of that? central joe, bacpacjac, hillst1 and 5 others like this. Thanks! I had cut a perforated disk to hold that stuff down in the bottom of the stove and cut it too small. Then I saw the drain screen peeking out of the piles of stuff on the bench. (I should take a pic of that mess, I have to work IN the desk drawer sometimes to have space to do anything). I crimped the edges of the drain thing until it would squeeze down into the inner can. Worked! central joe, bacpacjac, MrFixIt and 1 other person like this. I have a lot of different alcohol stoves but never seem to take any photos of them. Found one old shot of one in use on a cold backpacking trip. central joe, bacpacjac, MrFixIt and 4 others like this. Just spray it flat black. I need a stove that I can heat my little espresso maker with. It is tiny, so this evening I made a Trangia type stove. Tomorrow I will drill the holes and get some pics I hope. For the espresso maker I need a stove that will sit inside or under a pot rack thing that fits it. I think this will do it. central joe, bacpacjac, pellegrino and 2 others like this. You can use almost anything as a wick, TP, real wool, T shirt, even sand, as long as it allows wicking action for the alcohol. Eventually the top lip of anything flammable will char, but the stove will still work, until the wick crumbles away anyway. The biggest ones are that you're not limited by the vagaries of a thermal feedback loop, you've got an integral potstand, and due to the inner can there's more (a little, anyway) resistance to having your flame body blown around by any errant breezes, and let's not forget cheap & easy to build and can hold their own fuel bottle (if you can find the right one). Cons are that it may not be as fuel efficient as a well-constructed pressurized stove, wider pots will still benefit from a pot stand (if it's taller than the stove you'd need to cap it to keep the fuel reservoir from burning), simmering and snuffing are more difficult (same issue with pop can stoves, a big plus to a Trangia; these can be done if you're willing to also carry the necessary accessories). central joe, bacpacjac, MrFixIt and 3 others like this.